Lowering of the minimum claiming age in 1961 reduced average monthly income and increased the poverty rate in old age for male-headed households. Policy debates about how to reduce the projected divergence between currently promised Social Security benefits and the revenues that the system is expected to receive often include discussion of raising the minimum retirement age. In recent years, Australia, Austria, Germany, the United Kingdom, and other developed nations have raised the minimum age of early retirement. A new study examines how a decrease in the U.S. minimum claiming age, enacted in 1961, affected the living standards of retirees. The option for early retirement created by the Social Security Act amendments of 1961 lowered the minimum age at which individuals could claim benefits to 62. The benefits paid to an individual beneficiary were adjusted to reflect the age at which they began to be paid. Claiming earlier reduced an individual's annual benefits relative to what they would have been if the individual had claimed at the normal retirement age, which was then 65. Gary V. Engelhardt, Jonathan Gruber, and Anil Kumar, in the study Early Social Security Claiming and Old-Age Poverty: Evidence from the Introduction of the Social Security Early Eligibility Age (NBER Working Paper No. 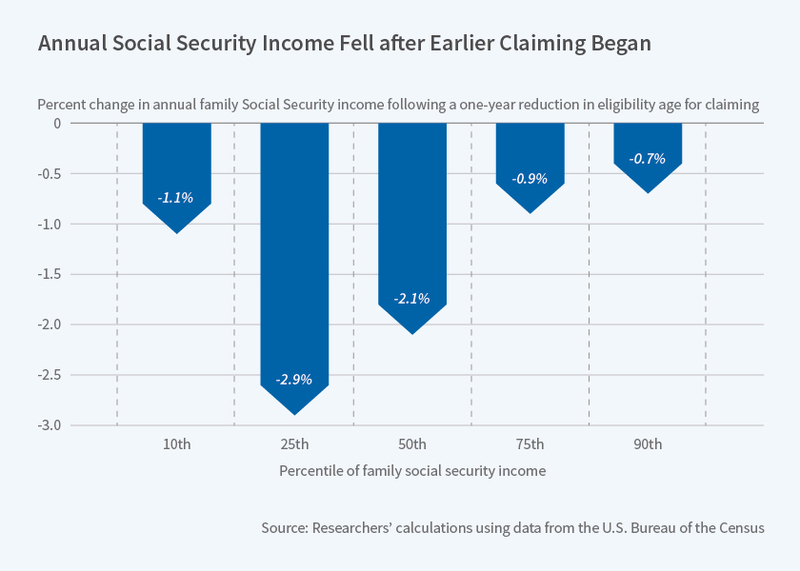 24609), find that the change in the claiming age resulted in an average decrease of 1.5 percent in Social Security income for male-headed families. The change was associated with a decrease in total income for the poorer half of households, and a large rise in elder poverty and income inequality. The researchers compare men who retired before and after the decline in the minimum claiming age, in particular those born between 1885 and 1916. They find that the option to retire early proved so popular that the average age of claiming benefits fell by 1.4 years. The most common age for claiming benefits became 62. This led to a median reduction in Social Security income of 3 percent for male-headed families; for those at the 25th percentile of the Social Security income distribution, the decline was 4 percent. Lower Social Security income was associated with lower total income, but only for those in the bottom half of the income distribution. A $1,000 boost in benefits was linked to a 6.7 percentage-point decrease in the poverty rate. The reduction in the early retirement age coincided with a period of increasing generosity of Social Security benefits overall. Thus, the rise in the level of benefits in part offset the reduction for any individual who claimed early. The researchers point out that this is an important consideration when trying to project the impact of future policy changes.